Join us in the Dolomites, Italy on August 3 - 8, 2019! Explore the magic of the legendary Dolomite mountains with Yoga - Hiking and Mindful moments in this UNESCO World Heritage site. We’ll be located for three nights at the beautiful mountain hut with an outdoor Sauna at the mountain lake "Croda da Lago" and two nights at the famous Rifugio Scoiattoli facing the phenomenal climbing paradise of Cinque-Torri. A refreshing dip in the warm weather in a lake facing Mount Croda is soothing for the soul. Every morning we enjoy yoga and meditation practice OUTDOORS and the rest of the day is spent with hiking trips for all levels of mountain hiking experienced people Relax and recharge your batteries in the fresh mountain air. We’ll be located for three nights at the beautiful mountain hut with an outdoor Sauna at the mountain lake "Croda da Lago" and two nights at the famous Rifugio Scoiattoli facing the phenomenal climbing paradise of Cinque-Torri. Important note: On day 4 (August 6) we will make a full day of mindful hiking with our backpacks to move to the mountain hut Rifugio Scoiattoli where we spend next two nights. The combination of mountains, yoga and mindfulness brings us inner peace, clarity and new vital energy for our lives. The package includes a tour of wonderful places and hiking to the mountains. Gurdeepak is a qualified yoga teacher, mountaineer, and climber. A lot of his growing-up years were spent in the Himalayan and Karakoram mountain ranges where his love for outdoors comes. He believes outdoor settings are a catalyst for self-reflection. Gurdeepak has a post-graduation diploma in human resources and advanced masters in sports management from the IASST - International Academy of Sports Science and Technology at the Ecole Polytechnic Federale de Lausanne. 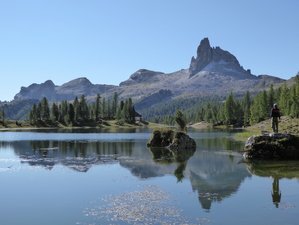 The retreat will take place in the Dolomites, a mountain range located in northeastern Italy. This place has been recognized and declared by the UNESCO as one of the world heritage sites. During the retreat, you will be served daily delicious breakfast and dinner included in the package. Please book your flight to arrive at Venice Marco Polo Airport (VCE). Transfer from and to this airport is available upon request. Our meeting place is the famous town of Cortina d'Ampezzo (city center) on 3 August 2019 at 13:30. At ca 14:00, we will proceed towards the parking from where we have to walk about 2 - 2.5 hours to the hut. We shall be back in the valley on the other side on 8 August 2019 at ca.10.30. The rest of the payment should be paid 3 days before arrival. Aroga is all about yogic knowledge in order to achieve a healthy state of being.